Elizabeth Busey. Refugia. Reduction Linocut. 15 x 24in, Edition of 11, $275 unframed. 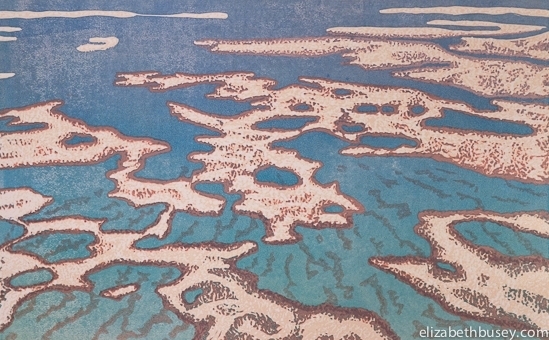 My second linocut looks at coral from a closer perspective. Here shallow waters make some coral appear to be above the water, and yield pools of a particular blue green hue. Refugia considers the coral around the islands of Palau — an isolated island group in the Pacific Ocean. Refugia means places where organisms can grow during a period of unfavorable conditions. In the case of Palau, researchers have found an area with water much more acidic than usual, where the coral continues to flourish. Scientists think these conditions were caused by an El Nino weather pattern. The discovery of this refugium points to possible ways corals might adapt to changing conditions. Sometimes nature brings it own hope. I’m taking a short break from my Beloved series to consider some new ideas and just breathe. Sometimes you have to get out of the studio and experience this amazing world. Wishing you a summer (or winter for you southern hemisphere folks) of inspiration and wonder.